Eric Bana (Star Trek) in a movie hailed by critics as “unforgettable, tense and inspiring” (Movieline). Respect and admiration. I think those might be the keywords behind director Peter Berg's approach to adapting 'Lone Survivor' to the big screen, and despite any flaws in the movie's execution or deviations from history throughout its runtime, the filmmakers never lose sight of those two lofty goals. A stirring tribute to fallen heroes and an utterly assaulting depiction of war, the movie is a visceral testament to brotherhood and sacrifice, all marked by unrelentingly brutal action and a dedicated eye for detail. Based on Marcus Luttrell's non-fiction book of the same name, the film focuses on Operation Red Wings, a failed Navy SEALs mission that occurred during the war in Afghanistan. As part of the operation, four SEALs -- Marcus Luttrell (Mark Wahlberg), Michael Murphy (Taylor Kitsch), Danny Dietz (Emile Hirsch), and Matt Axelson (Ben Foster) -- are sent to capture an infamous Taliban leader. But once the team is dropped into the wilderness they soon lose communication with their base. Faced with an impossible moral dilemma, the SEALs become trapped behind enemy lines and must fight to survive against an ambush of armed soldiers. From the get-go, Berg strives to elicit a strong sense of authenticity, layering the main title sequence with archive footage of actual Navy SEALs training, respectfully and economically establishing the rigorous physical and mental preparation that they endure. We then segue into the dramatized true-story itself, initially witnessing brief flashes of the mission's aftermath. To this point, there are no real attempts to keep the operation's doomed outcome a secret to the audience (if the title doesn't already spell it out). We more or less know exactly where we're going to end up, but this early reveal doesn't mitigate any of the film's soon to be mounting tension. Instead, it perfectly sets the stage for the drama to come, giving us a clear point to build toward. And from that harrowing point, we quickly transition back in time, allowing us to the meet the film's characters at a moment of respite. These early sequences at the Navy base offer an invaluable window into the SEALs day to day routine, giving us an important look at the deep friendships that form between them. We watch as the soldiers joke around, tease each other, and share personal stories, helping to establish the characters before throwing them into danger. Throughout it all, Berg employs a surprisingly delicate hand, using a faintly vérité style that gives the scenes a realistic yet slightly dreamy quality. And when the mission briefing does finally occur, the pacing starts to kick into high gear, with frequent shaky camera movements and cross-cutting between the SEALs and Taliban that create a forceful air of unsettling momentum. This gradually escalating suspense continues to develop as our protagonists are thrust into their mission, and though we know things will eventually go wrong, Berg does a fantastic job of keeping the audience on their toes. It's inevitable that a firefight will breakout, and the distressing anticipation that slowly builds up to the first shots fired is palpable -- and once the bullets do start to fly, all hell breaks loose. The filmmakers create a gut-wrenchingly visceral sense of action, leading to one of the most pulse-pounding depictions of war-time battle to ever hit the screen. Though there is an occasional "video game" quality to the shooting style (exemplified by frequent crosshair POVs and periodic slow motion) the action remains gritty and raw, mostly avoiding Hollywood gloss and sensationalism. One particular scene that involves the characters falling down the side of a mountain is especially striking, and is easily one of the most bone-crushing stunts that I've ever seen. And despite the movie's primary focus on brutal action, the filmmakers never lose sight of the characters and their deep bond of brotherhood, maintaining an engaging story of friendship and survival beneath all of the explosions. With that said, the film's depiction of war isn't exactly very deep or nuanced, and there are times when the movie's sense of patriotism feels a little overbearing and superficial. Likewise, while Berg and company have tried hard to remain faithful to the real story that inspired the film, it's my understanding that there are some notable embellishments here and there (particularly in the third act). Of course, such tactics are understandable, and when the movie sticks to visceral action and brotherly bonds, it remains unrelentingly gripping and genuinely affecting. Finding the right balance between engaging action and respectful tribute, 'Lone Survivor' presents a real life story of heroism, sacrifice, honor, friendship, and endurance. Director Peter Berg recreates the doomed Navy SEALs mission with the utmost admiration for its fallen heroes, creating a stirring and emotional examination of survival. Though some of the movie's inspirational aspects can be a little forced and simplistic, a solid focus on character and an absolutely gut-wrenching depiction of war-time battle helps to even out these occasional flaws, resulting in a powerful salute to our country's brave soldiers. 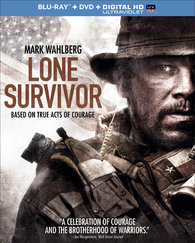 Universal brings 'Lone Survivor' to Blu-ray on a BD-50 disc that comes housed in a keepcase with a cardboard slipcover. A separate DVD disc and instructions for an UltraViolet copy are included as well. After some skippable trailers, the screen transitions to a standard menu. The movie is provided with a 1080p/AVC MPEG-4 transfer in the 2.40:1 aspect ratio. Shot on the Red Epic, this is a nicely detailed and impressive image that leaves little to complain about. The digital source is mostly pristine, but there is some grain-like noise visible throughout (particularly in the dark) and very minor signs of false contouring and shimmering in isolated shots. There are also a few moments where the picture exhibits an overly digital, smooth look in motion, but this effect is likely inherent to the shooting methods. Clarity is very strong, revealing a great sense of fine detail. Close-ups are especially striking, highlighting every dirty pore and unkempt whisker on the soldiers' faces. Depth is also impressive, bringing a life-like sense of dimension to the image. 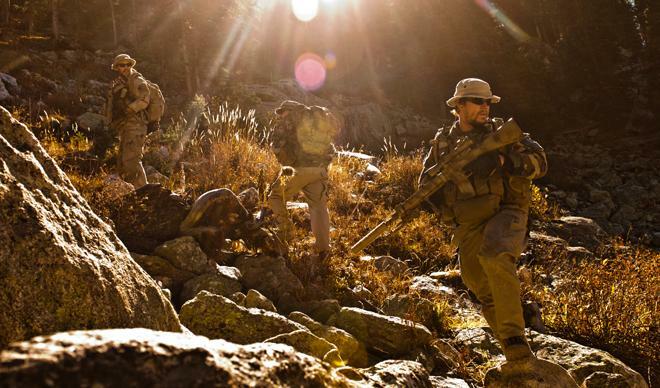 Colors adhere to a slightly stylized palette that favors browns, yellows, beiges, and greens, emphasizing the Afghanistan wilderness setting. Contrast is high but well balanced and black levels are solid and consistent. 'Lone Survivor' looks very good on Blu-ray, offering a sharp and appropriately stylized image that bolsters the film's gritty intensity. The film is presented with an English DTS-HD MA 5.1 mix along with a DVS 2.0 mix and a Spanish DTS 5.1 mix. Optional English SDH and Spanish subtitles are also included. Nuanced, spacious, and absolutely assaulting when it needs to be, this is a powerful and fully enveloping track. Dialogue is full and easy to hear throughout, even despite the cast's frequent whispering. The movie's sound design is both subtle and aggressive, creating a wide and layered atmosphere. Early scenes set at the base offer a convincing sense of place, and the manner in which we can constantly hear approaching helicopters in the far off distance is especially immersive. Directionality and imaging is precise and natural with smooth panning effects that move from speaker to speaker all around the room. 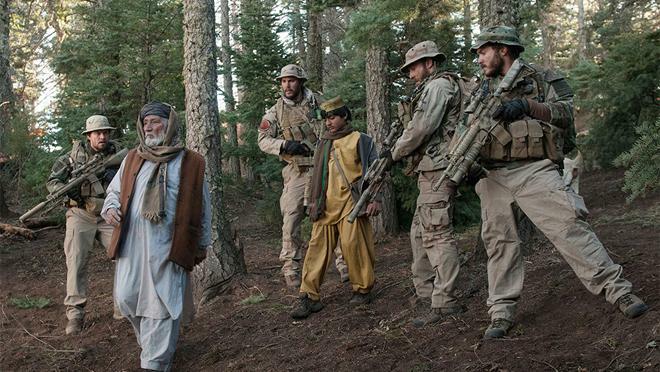 When the characters reach the Afghanistan wilderness, the mix provides a similarly authentic level of ambiance, spreading buzzing flies and wandering goats throughout the soundstage. And once bullets start to blaze, the audio kicks into high gear, becoming a relentless barrage of action that still maintains a delicate layer of balance and design. Whizzing gunshots hit the rears and carry a piercing pop, churning helicopter blades rustle with a deep rumble that hits you right in the gut, and explosions go off with a commanding low frequency boom. One sequence that features the characters falling down a mountain is especially noteworthy for its bone-crushing effects work. Dynamic range remains wide and distortion free, and the film's gently escalating score by Explosions in the Sky and Steve Jablonsky comes through with strong fidelity and separation. With that said, there is a rare anomaly here and there where I could make out what sounded like the faint rustling of the actors' microphones, but this is barely noticeable and not a real concern. Immersive and artfully designed, the audio mix offers a powerful home theater workout that never loses sight of a delicate level of precision and design beneath all of its explosions. Universal has provided a decent assortment of supplements including a few Blu-ray exclusive featurettes that offer insights into the filmmaking and the real life story that inspired the movie. All of the special features are presented in 1080p with Dolby Digital 2.0 audio and no subtitle options (unless noted otherwise). Bringing the Story to Light (HD, 5 min) – This featurette offers behind-the-scenes footage and cast and crew interviews dealing with the film's production. We learn details behind Berg's introduction to the story and how he got the job, along with the cast and crew's determination to respect the real life heroes that they are portraying. Some elements of the featurette are repeated in subsequent extras, but this is still a worthy watch. The Fallen Heroes of Operation Red Wings (HD, 16 min) – Presented in four parts viewable separately or together, these are profiles on the real life Michael Murphy, Matthew Axelson, and Danny Dietz that feature interviews with their families and the film's the cast and crew. There's also reel of photos of more deceased heroes. 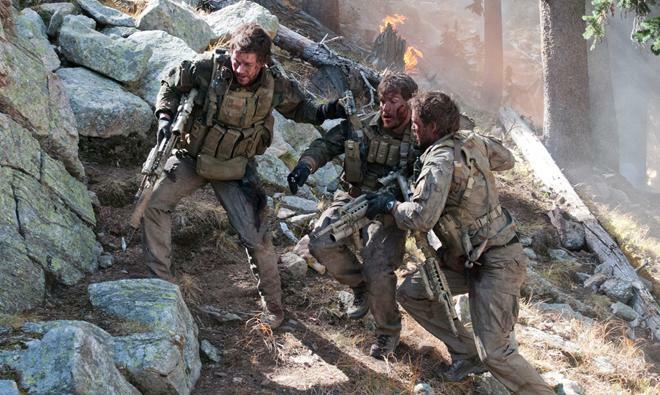 'Lone Survivor' is a powerful and absolutely visceral tribute to our country's fallen heroes. Though the film's sense of patriotism can be a little forced and simplistic, Berg's overall approach is respectful and seemingly authentic. The video and audio are both impressive, offering an immersive home theater experience. Though not packed with supplements, the included featurettes provide some worthwhile insights into the filmmaking process and the real life story that inspired the script. Despite some minor flaws, the movie is a gripping and inspiring piece of filmmaking, and this disc from Universal features a fantastic technical presentation. Highly recommended.